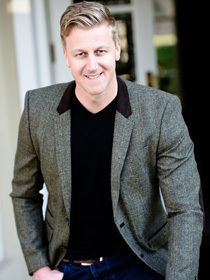 Founder and President of CliffCentral.com, host of “The Gareth Cliff Show” and former South African Idols judge; Gareth Cliff is one of South African radio’s most prominent personalities. On 1st May 2014, Gareth took the giant leap from traditional terrestrial radio to the future of internet and mobile with the aim of creating the pre-eminent “infotainment” online content hub. CliffCentral offers a variety of authentic and relevant conversations – informative, entertaining, empowering and inspiring – targeting the engaged early adopters, connected in a digital world. Gareth kicked off his career at Radio TUKS in Pretoria in 1996 and later “graduated” to 702 Talk Radio as a producer while he was still studying. It was here that he was given his first major break in radio where he attracted a lot of attention for his irreverence and intelligence, replacing the legendary John Berks on the 702 Breakfast Show in 2001. In 2003 Gareth accepted an offer on 5FM where he remained for ten years and hosted the breakfast show for seven of those years. Gareth has won numerous awards over the years for best radio and television personality and presenter and regularly hosts events both as an MC, speaker and a conference facilitator. He presented a 2015 TEDx Talk at London Business School on mobile technology and the changes it is bringing to Africa, as well as being a panelist SXSW in Austin Texas in March 2017 and at the Deutsche Welle Global Media Conference in Bonn, Germany in June 2017. Beyond the public eye, Gareth has demonstrated his commitment to his audience and passion about South Africa by generously giving of his time to causes that are close to his heart. He is the ambassador of several education initiatives and is the patron for Headway Gauteng.